Anyone planning on bringing their Venturi to the French day at Prescott this year? I missed it last year so am yet to meet any other Venturi owners - but am keen to amend that! I'm not a Venturi owner, so my opinion may not help. But it looks like the club won't be in attendance at Prescott this year due to the change in parking/no club area etc. It's mentioned in the Events section. Indeed. It's a shame that there may well be no official RAOC involvement. But even so, it would be nice to have a Venturi meet somewhere sometime, and this opportunity seems as good as any. 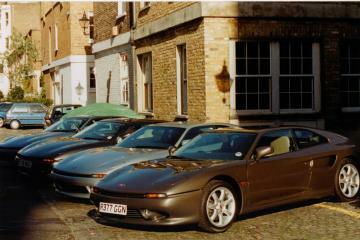 ewan wrote: Anyone planning on bringing their Venturi to the French day at Prescott this year? I missed it last year so am yet to meet any other Venturi owners - but am keen to amend that! I may consider a run over in the 260..... will only commit closer to the day though. We haven't met up for some time now. I seem to remember we had our own area in a previous year. Would that not be possible if we could guarantee some cars there, or have they changed the format? I could probably commit to the Sunday and Pauly's just up the road! Martin Guard wrote: I seem to remember we had our own area in a previous year. Would that not be possible if we could guarantee some cars there, or have they changed the format? In the events section is mentioned that they've changed the parking so there's no individual marque parking. If you all want to meet up somewhere else (hope everyone arrives on time) and the drive in together then I guess you'd be parked together. I will be going as it is an event we love. It is a big shame what they are doing to it though, it won't be the same anymore, it all sounds like they are more worried about the cash than the event itself. Hopefully it bombs and goes back to the way it was and always has been. Oh dear Prescott.... well hello Shelsley Walsh! Its just down the road from me and I could make some enquiries if enough of us are interested to create a display area. Martin Guard wrote: Oh dear Prescott.... well hello Shelsley Walsh! I can recommend it having been in the last few years with C.A.R. who, presumably, will be having a Club display area again this year. Lots to see, good atmosphere. I am in for that Martin, sounds good.